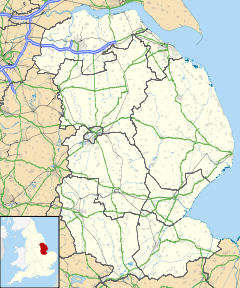 Donington on Bain is a village and civil parish in the East Lindsey district of Lincolnshire, England. It is situated approximately 6 miles (10 km) south-west from Louth and 6 miles (10 km) north from Horncastle. The village sits on the east bank of the River Bain, and in the Lincolnshire Wolds, an Area of Outstanding Natural Beauty. The Viking Way runs north to south through the village. Cadwell Park racetrack is approximately 4 miles (6 km) to the east. Donington on Bain Grade II" listed late 12th-century Anglican parish church is dedicated to St Andrew. It is of Early English style with an early Norman font. Within the church is a 17th-century memorial to the poet Thomas Kent. The church is in the Asterby Group subdivision of the South Wolds Group of churches of the Horncastle Deanery. The village has a primary school. The village public house is the Black Horse on Main Road. The village football team has been in existence since at least 1922, and currently plays in the East Lincs Combination Division 2 at Donington Park on Station Road. On either side of the valley sits a tower. It was reported in June 2009 that one of these, the tallest structure in the UK, Belmont mast, was to be reduced in height. The other is a Second World War ACE High early warning relay station at RAF Stenigot. Donington on Bain railway station served the village from 1875 to 1951. ^ "Parish population 2011". Retrieved 20 August 2015. ^ a b Historic England. "Church of St Andrew (1063688)". National Heritage List for England. Retrieved 7 July 2013. ^ Rodgers, Paul (22 June 2009). "Europe's tallest structure to be cut down to size". The Independent. Retrieved 4 July 2009. ^ Historic England. "Donington on Bain railway station (507000)". PastScape. Retrieved 7 July 2013. This page was last edited on 8 November 2018, at 11:37 (UTC).